Difference between revisions of "Royal Knights"
The Royal Knights (ロイヤルナイツ Roiyaru Naitsu) are an alliance of extremely powerful knight Digimon founded by Imperialdramon Paladin Mode in ancient times. They are the highest security of the Net, also known as "Guardian Deities" 「守護神 Shugoshin」. They may serve their Lord blindly, regardless if their Lord is good or evil. Some say that the Royal Knights are the ones who are closest to God. Imperialdramon Paladin Mode is not a member of the Royal Knights but is the founder. These are the known members of the Royal Knights. There are 13 members in total. 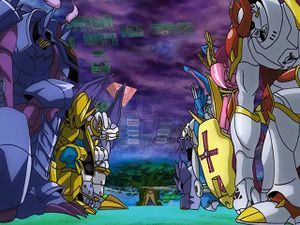 They are all Holy Knight type Digimon (Rapidmon Armor is also a Holy Knight Digimon, but there is no mention of him being a member of the Royal Knights). (Note: The X Digimon still count as the same Royal Knights). Though this group does not make an appearance in Digimon Tamers proper, the official Toei profile for Dukemon indicates it is a member of the Royal Knights. Dynasmon and Lord Knightmon serve the Fallen Angel Digimon Lucemon in destroying and recreating the Digital World. After several skirmishes with the Frontier Chosen the two Royal Knights finally destroy the Digital World and revive their Master, only to be betrayed when Lucemon kills them and absorbs all the data they have collected. The Royal Knights as a whole were originally viewed upon as being antagonists, due to being ordered to destroy the Human World under the command of Yggdrasill when the Digital World is set to collide with the Real World. However, it is more likely that Yggdrasill ordered the attack because he viewed the humans as threats after the action of Kurata Akihiro, especially after his massacre of Digimon years before using his own created Digimon, Gizmon, as well as using the collected life energy to revive Belphemon to rule both humans and Digimon. They appear once again as the servants of Yggdrasill enforcing Project Ark. 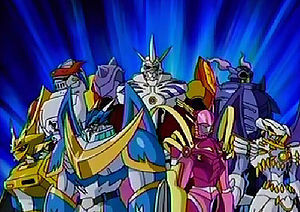 The Knights of note are Alphamon, Omegamon, Dukemon and Magnamon. However Dukemon questions Yggdrasill's motives causing him to aid Dorumon and his allies. This results in him being killed by Omegamon in a duel. This however fosters major doubt in Omegamon. Eventually Dukemon is reborn as Dukemon X. He then tells Dorumon (now DoruGreymon) to go to Yggdrasill. However DoruGreymon is barred by Omegamon (who challenges him personally to battle, agreeing to let him pass if he (DoruGreymon) defeats him (Omegamon)) and Magnamon. DoruGreymon is badly beaten but in a moment of desperation, evolves to Alphamon. He then informs the other two knights of his decesion to confront Yggdrasill. Omegamon acknowleges him as leader of the order and joins him, however Magnamon insists on following the will of Yggdrasill. The other two leave without a scuffle but Magnamon sends a warning to Yggdrasill. This causes Yggdrasill to order the Death-X-DORUguremon swarm to delete the Digital World and dispatch Death-X-DORUgoramon to take care of Omegamon and Alphamon. Despite his best efforts, Omegamon is unable to cause major injury to Death-X-DORUgoramon and it is Alphamon who defeats the Undead Menace. They enter Yggdrasill's inner sanctum and confront him but when they move to attack, Death-X-mon, who had evolved from Death-X Dorugoramaon, attacks. Alphamon Ouryuken after realising in battle that he is his evil clone, sacrafices himself to defeat Death-X Mon and both merge together and revert to Dorumon. Omegamon, now Omegamon X destroys [[Yggdrasill], restoring the Digital World. Later the two X-Antibody Knights speculate on Yggdrasill's motives, concluding he was likely working towards preventing his own destruction. They watch happily as Dorumon and his allies celebrate their victory. Omegamon, Medieval Dukemon/Dukemon and Magnamon appear as the remainder of the Royal Knights who fought Death-X-mon 10,000 years ago. They make appearances as the allies of the story's chosen children. At the end DORUmon is revealed to be their lost leader Alphamon. He merges with Ouryumon to form Alphamon Ouryuken who destroys Death-X-mon. They appear as the servants of Yggdrasill helping to enforce Project Ark. However, Alphamon and Ouryumon are fighting against Yggdrasill but make a compromise with him after they merge together to defeat Death-X-mon. The Royal Knights opposed the Bagra Army, but were scattered when the Digital World broke into pieces, and couldn't regroup until Kudou Taiki and Aonuma Kiriha helped them to pass between Zones with the use of the Digimon Xros Loader. Out of the Royal Knights, Ulforce V-dramon is first to be seen and the most prominent. He gives exposition about the history of the Digital World and tells that he once had a partner with whom he saved the Digital World a few times, and as a result, was made a Royal Knight. Other Royal Knights that appear are Duftmon, Craniummon, Lord Knightmon and Dynasmon, who all the part in the final battle at Jupiter Zone. Dukemon and Sleipmon are mentioned but not seen, said to be suppressing resistance in other Zones during the final battle, and Examon and Magnamon appear briefly in a flashback. In addition to them, Omegamon appears in a flashback, having battled against Tactimon and Bagramon at the stem of Yggdrasill. At the time of the manga's events, Omegamon's fate is unknown; he is thought to be deceased, but Shoutmon has the same aura as him.